We all look back on our childhood with blame and praise. I sometimes ask myself, “Who helped me become the woman I am today?” At the head of the list are my parents, extended family, teachers, peers and, believe it or not, Kankakee by the Sea. They all had a profound impact on my life. It is hard to imagine that a town would be in the top five, but each of these things taught me life lessons to pass on to my grandchildren. I grew up in a small blue-collar town called Kankakee, Illinois. Laughingly, when people ask me where I grew up, I say, “Kankakee by the Sea.” Believe me, there was no sea. There was the dangerous current of the Kankakee River and the Kankakee State Hospital for the mentally ill. The town had two State Governors who were carted off to prison, and a little Jewish girl (me) who stood out because of her religion and her family’s prosperity. The environment of the community and its people had a profound effect on shaping my character. For me, “Kankakee by the Sea” was a lesson in mental survival. Little did I know at the time that the town would provide me with an ability to learn values and deal with life. Growing up in Kankakee was a lesson in true grit. I was one of only three Jewish kids in my high school class of four hundred or more students. I did not come from a blue-collar family. I realized early on that I had a choice: I could sink or swim. I decided to swim and learned to get along with kids regardless of religious beliefs, monetary status or skin color. I learned to stand up for my beliefs. I learned that I had to try harder to be accepted. At 18, I left for college and never looked back, but I took lessons from “Kankakee by the Sea” with me. They have served me well over the years. As my husband says, “One of the reasons I am attracted to my wife is because of her small town qualities; her essence.” Again, thank you Kankakee! Today I live a worldly, sophisticated, and charmed life (thank you to my husband, Shelly). I am well educated (thank you to my mom and dad), and yet, I continue to have my small town values; that quality of wearing my heart on my sleeve and gratitude for absolutely everything that happens in my life. How have I passed on my small town values to my Grandchildren? All of my Grandchildren have traveled to “Kankakee by the Sea” and have seen the home I grew up in, the grade school, and even the high school where I spent hours learning. I would advise you to take your time to do the same. I promise you an enjoyable adventure. Tell your Grandchildren your stories and take them on a tour of the neighborhood where you spent your youth. The children will love learning about their Grandparents, their family tree, and the lessons you learned in your young life. And then, put these stories in writing. Learning to value their history through their Grandmother’s eyes and to hear, then read, your stories will be a keepsake they will forever call upon. We have the responsibility to pass on our history and values… our very essence. My Grandchildren love my stories. Your Grandchildren will love yours, too. As many of you know, I have a book soon to be released… February 5 to be exact. But when I say it is my book, that is not quite accurate. Actually, it is YOUR book, your story, a journal that you complete. The end product is an heirloom for your grandchildren to contain your words about the life, loves, lessons and more from you, their Grandmother. 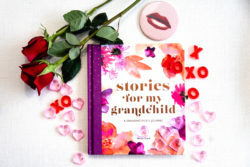 Stories for my Grandchild allows every grandmother around the world the opportunity to write the story of her life in her words in her journal. It is truly an heirloom gift, from a grandmother to her grandchildren. And, hopefully, her grandchildren will pass it on to their grandchildren. I hope you will love and enjoy becoming an author, too, darlings! Please, pre-order your book, Stories for my Grandchild, on Amazon today. I promise you; it is a gift for you and a lifelong gift for your Grands. I am thrilled because this gift is not at all about me. It is all about you! I’d love to know how you have shared your life lessons with your Grandchildren. Have you any tricks for making an impression on them? Do tell! How does one connect with a grandchild who lives half-way across the country and we only see her once or twice a year for short periods of time? She’s 4 yrs. old. Connect by phone, computer, cards and written notes that will entertain your little four year old. Keep sending and calling her. Send her little packages with surprises enclosed. She will look forward to the mail! Never give up. From my experience, those smart little minds will always remember the feeling of love she felt from all those special packages and communications. Hence, you have given her the gift of a grandparent, grandchild relationship.